This post was written by Kacee Reguera, an undergraduate senior at FSU pursuing a Studio Art degree in Printmaking, Artist’s Books, and Photography. A love for art preservation and the history of our university led her to an internship with Heritage & University Archives at Special Collections. During the summer of 2018, we received a collection of items belonging to Katherine W. Montgomery and her family. Katherine Montgomery attended Florida State College for Women from 1914 to 1918 and became heavily involved in athletics. She was on the varsity team of several sports, a member of the F-Club, and the sports editor for The Florida Flambeau. In 1920, she began teaching Physical Education at Florida State College for Women (FSCW) and spent over 30 years leading the Physical Education department. She developed curriculum for the intramural athletics program at FSCW, spearheaded the construction of a new gymnasium, and even published a book titled “Volleyball for Women”. Katherine Montgomery’s contributions to our university have proved timeless. We used this collection as an opportunity to commemorate her lasting effect on our university. The collection contains items belonging to three generations of Montgomery family members. Katherine had two younger sisters that also attended FSCW during the 1920s. The collection includes diaries and scrapbooks belonging to each of them. These items brought to light how involved with FSCW the Montgomery family really was. This collection was gathered over time by Edwin F. Montgomery, Katherine’s nephew. Many of the items in the collection are ephemera relating to Katherine’s passing. These items provide a much broader understanding of the impact Katherine had not only on her community, but also on individuals. With the new items acquired from this collection and some from previously held collections, we curated an exhibit in the Norwood Reading Room at Strozier Library that forms a better understanding of Katherine’s values and ideals, as well as her contributions to Florida State College for Women and Florida State University. The exhibit features Katherine’s original mortarboard and tassel, excerpts from her diaries and notebooks, and awards she received. The Norwood Reading Room is located on the second floor of Strozier Library and is open Monday-Thursday, 10am to 6pm and on Fridays 10am to 5:30pm. Please stop by to see the new exhibit! Will Eisner Week kicked off on March 1st, so it’s a great time to remind library users of the rich graphic novel and comics resources available in Special Collections & Archives. If you’re wondering who Will Eisner is and why he gets his own week, you can check out SCA Manuscript Archivist Rory Grennan’s brief and informative essay on Eisner’s contribution to comic books here. Florida State University boasts multiple collections with emphases on comic books and graphic novels, including the Robert M. Ervin Jr. Collection[ and the Alicia Korenman Graphic Novels Collection. The Alicia Korenman Graphic Novels Collection is a diverse collection of media, including comic books and strips, graphic novels, zines, books, as well as DVDs and VHS tapes. As detailed in the collection’s finding aid, Korenman’s interest in how women were portrayed by the comic book industry began in the 1990s. She discovered that alternative and small press comic book publishers tendered stories based on everyday experiences and emotions, as well as the female experience. The contents of the collection run the gamut from classic Archie comics from the 1990s to Japanese manga, including a manga adaptation of the popular anime Cowboy Bebop, as well as a robust assortment of zines. What’s a zine? A zine, according to the Barnard Zine Library, is “short for fanzine or magazine, […] a DIY subculture self-publication, usually made on paper and reproduced with a photocopier or a printer.” While several zines are in English, at least two titles are also in Spanish, including Tripodologia Felina, no. 1 (published in 1992 by Producciones Balazo) and Asi Pasan los Dias/Escuadron Rescate (written and published by Matt Madden and Jessica Abel, published in 1998). The self-published and small-scale nature of zines complements Korenman’s interest in more personal stories. These zines are only the tip of the iceberg and we at Special Collections & Archives encourage students, faculty, and members of the public to check out the collection, and our other resources at any time! Post written by Lisa Play. This December is the 85th anniversary of Paul Dirac’s Nobel Prize for Physics. Dirac was an English theoretical physicist who became a fundamental contributor to the development of quantum mechanics and quantum electrodynamics. The Dirac Equation, which was formulated in 1928, described the behavior of fermions, or subatomic particles, and predicted the existence of antimatter. Telegram from the Royal Swedish Academy of Science informing Paul Dirac that he and Professor Erwin Schrodinger are being awarded the Nobel Prize in Physics, 1933. See original item here. FSU Special Collections & Archives houses The Paul A.M. Dirac Papers which contains photographs, correspondence, books, manuscripts of scientific papers, and calculations. Images of Dirac with famous individuals within the scientific community such as Albert Einstein or Werner Heisenberg and dozens of letters to Dirac after his receiving of the Nobel Prize can also be found in the collection. You can also explore more of the collection’s Nobel Prize materials, as well as other digitized materials, in DigiNole, FSU’s digital repository. Written by Michaela Westmoreland, an Editing, Writing, and Media undergraduate student working as a Library and Museum Assistant with the Special Collections & Archives of FSU’s Strozier Library. This semester, she has been working directly with The Paul A.M. Dirac Papers to create metadata records for the photographs of the collection for future digitization. October is a special month for those us in the archives. It’s an entire month to celebrate our collections and, more importantly, our work which is often shrouded in mystery. Even for our co-workers in libraries. So, archivists have embraced American Archives Month, held every October, as a way to share what it is we do. For us here in Special Collections & Archives this year, we started October by participating in #AskAnArchivist day on October 3, 2018, by staging a takeover of the FSU Libraries twitter feed, answering questions and participating in discussions that happened all over the Twittersphere. 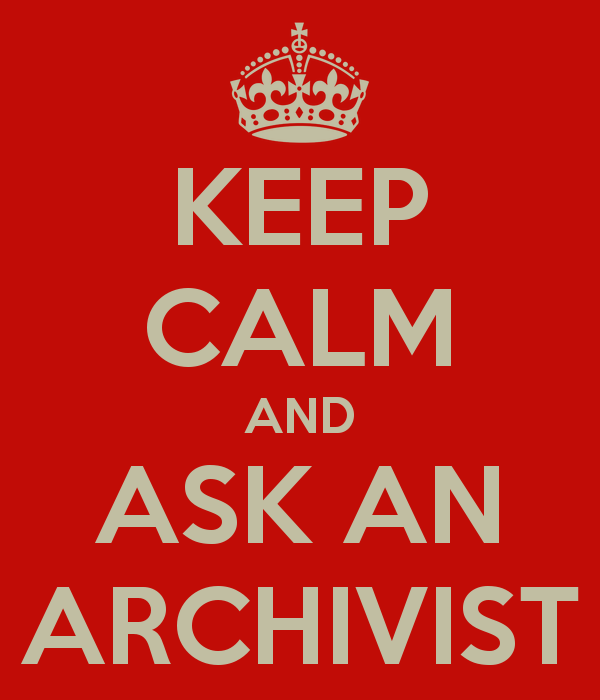 You can check out the hashtag #AskAnArchivist and the FSU Libraries twitter page to catch up on those tweets. We had some celebration of the month here on the blog. We opened a new exhibit on protest in poetry, highlighted our Artist Book and Napoleon collections, shared a new digital collection available in our digital library, talked about our new records on FSU presidents, and looked for the spooky side of Special Collections for Halloween. Special Collections & Archives hosted our first Open House for Archives Month this year for our faculty and staff here in FSU Libraries. We hope to grow this event in the coming years so more people on campus and in the community can come and see our collections and talk to us about our work. Lastly, we also had our annual tradition of visiting Paul Dirac’s gravesite and cleaning the headstone. Dirac, a Nobel Prize-winning physicist, retired to Tallahassee and taught at FSU while he lived here. Upon his death, his papers and collections came here to FSU and is a cornerstone collection to our History of Science materials. Special Collections & Archives, along with Strozier Library, the Claude Pepper Library and the Heritage Museum are closed in observance of Independence Day. All our spaces will resume normal hours on Thursday, July 5, 2018. We wish you a safe and happy Fourth of July! Inaugural, President John E. Champion, left to right, Justice Richard E. Ervin, Govenor Haydon Burns, justice Campbell Thornal, Justice B.K. Roberts. Established in 1966 by former Florida Supreme Court Justice B.K. Roberts, Florida State University’s College of Law has contributed many notable individuals to the law community, such as current Florida House of Representatives Majority Leader Adam Hasner and current Senior Judge for the United States Air Force, W. Thomas Cumbie. A scrapbook documenting the planning of the school is located in Special Collections & Archives. D’Alemberte dedicated window. Located within the FSU Heritage Museum. In October, Florida State University honored Talbot “Sandy” D’Alemberte, Florida State University President Emeritus, former Dean of the Florida State University Law School, and former President of the American Bar Association through the dedication of a window at the Heritage Museum in Dodd Hall. Featured are the highlights of D’Alemberte’s career, celebrating his service to the community and the university. Florida State University’s College of Law, College of Medicine, the State Capitol, and his childhood home in Tallahassee can be seen within the window. During his tenure, D’Alemberte was responsible for envisioning and completing the Village Green for the College of Law, with its cluster of historic buildings and rotunda, the design inspired by Thomas Jefferson’s plan at the University of Virginia. Talbot “Sandy” D’Alemberte (center), current FSU President John Thrasher (Left) and former FSU President Dale Lick. The exhibit created for the unveiling of the window is still on display within the Heritage Museum. The exhibit and the window are open to the public for viewing, Monday through Thursday from 10 a.m. to 4 p.m. EST. The article documenting the unveiling of the window can be found by clicking here. FSU Special Collections & Archives will be participating in #AskAnArchivist Day again this year! We’ll be taking over the FSU Libraries Twitter account (@FSULibrary) from 10am to 2pm on Wednesday, October 4, 2017, to answer all your questions about our materials, what we do and why we do it. connect directly with archivists in your community—and around the country—to ask questions, get information, or just satisfy your curiosity. You can take a look at how FSU participated for last year’s event on Storify. So, if you have a question for us, tweet at the @FSULIbrary handle and make sure to use the hashtag #AskAnArchivist with your question. Or, if you have more general questions about archives around the country, ask your question with that hashtag and you’ll get answers from lots of archives and museums that will be participating around the country. Happy Labor Day, or the unofficial end of summer in the US. Here in the South, students have been back to school since mid-August in some cases but we have had a few pleasant mornings so maybe a north Florida fall is coming earlier than usual? We can only hope! In celebration of Labor Day, Special Collections & Archives is closed Monday, September 4th. We will resume our normal operating hours on Tuesday, September 5th. We wish everyone a safe and happy Labor Day weekend! In looking for an appropriate image to accompany this post, we found the below image. It made us wonder, is there a union for circus workers? While we couldn’t find a dedicated one, the American Guild of Variety Artists does include circus performers as part of their family. You learn something new every day! No word on whether those poor souls unloading a lion are covered though.